Infection results in a buildup of pus and tissue swelling within the tooth. This causes a toothache. The toothache may stop if pressure is relieved. But the infection will remain active and continue to spread. This will cause more pain and can destroy tissue. The main symptom is a severe toothache. The pain is continuous. It does not stop. It can be described as gnawing, sharp, shooting, or throbbing. Your dentist will closely look at your teeth, mouth, and gums. It may hurt when the dentist taps the tooth. Biting or closing your mouth tightly also increases the pain. 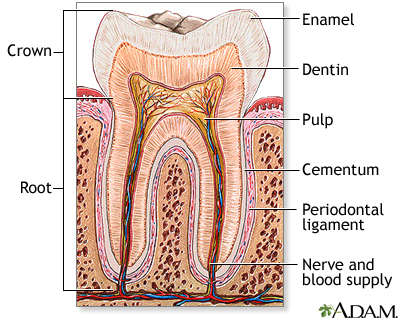 Your gums may be swollen and red and may drain thick material. Dental x-rays and other tests can help your dentist determine which tooth or teeth are causing the problem. Your dentist might prescribe antibiotics to fight the infection. Warm saltwater rinses may help ease the pain. Over-the-counter pain relievers may relieve your toothache and fever. Do NOT place aspirin directly on your tooth or gums. This increases irritation of the tissues and can result in mouth ulcers. 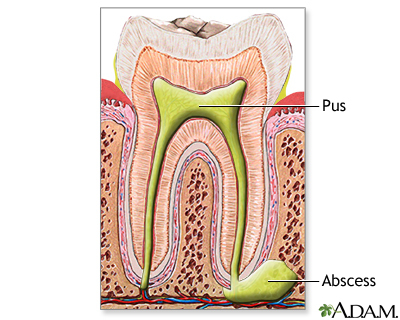 If you have a severe infection, your tooth may need to be removed, or you may need surgery to drain the abscess. Some people may need to be admitted to the hospital. Prompt treatment cures the infection in most cases. The tooth can often be saved. Call your dentist if you have a throbbing toothache that does not go away, or if you notice a bubble (or “pimple”) on your gums. Prompt treatment of dental decay reduces the risk of developing a tooth abscess. Have your dentist examine any broken or chipped teeth right away. Martin B, Baumhardt H, D'Alesio A, Woods K. Oral disorders. In: Zitelli BJ, McIntire SC, Nowalk AJ, eds. Zitelli and Davis' Atlas of Pediatric Diagnosis. 7th ed. Philadelphia, PA: Elsevier; 2018:chap 21. Mehta NR, Scrivani SJ, Spierings ELH. Dental and facial pain. In: Benzon HT, Rathmell JP, Wu CL, Turk DC, Argoff CE, Hurley RW, eds. Practical Management of Pain. 5th ed. Philadelphia, PA: Elsevier Mosby; 2014:chap 31.